HAL ROBINSON, a New York landscape painter, Hal Robinson became known in the early twentieth century for Tonalist and Impressionist-inspired paintings of rural subjects, winter scenes, and river, ocean, harbor, town, and garden views. The details of his training are unknown. By 1896 he was living at 406 West 57th Street, and that year he showed for the first time at the National Academy of Design, contributing a work entitled "The Meadow" to the Academy's spring annual. By 1909 Robinson had moved to 45 John Street in lower Manhattan. That year he exhibited two works at the Academy: "After a Spring Rain, and After the October Storm." In 1910 he sent "After a Spring Rain" to the Corcoran Annual in Washington D.C. and showed the "Last Glow" at the Academy. 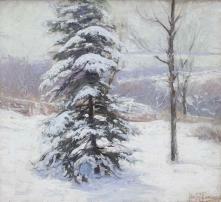 His last contribution to the Academy was a year later when he exhibited "Saw Mill River and The Ice-Bound Hudson.'' The Hudson was a subject of particular appeal for Robinson, who portrayed it from the Palisades, north of Manhattan, as well as at night in softly toned images. In addition to painting in Westchester and upstate New York, Robinson is known to have worked in Old Lyme, Connecticut, where he joined the town's artists' colony.